Last July I posted about Big Dog starting a new school. 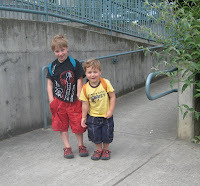 My trepidation about moving him to a new place after being in his old preschool for so long, my anxiety about his transition, my projected drama. Turns out, he had none of that, he loved it. 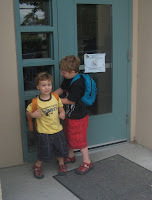 And last week, just under a year from his big brother's move to the new school, Little Dog joined his brother at preschool. We decided to have both boys attend part time instead of Big Dog going full time and Little dog staying home. By the giant grin on his face when I told him he was going to school, and the giddy excitement of his big brother, telling me all the ways he was going to introduce Little Dog to his school, I know we made the right decision. We took him for the first day yesterday (keep in mind, blog time is not real time, so I don't mean a literal yesterday here). He couldn't wait to get out of the car, and was hardly willing to pose for photos. 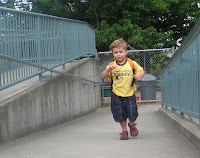 He and Big Dog did their usual race up the ramp, but this time, at the top of the ramp he entered his new school as a student for the first time. He was greeted warmly by the kids he's seen on a daily basis at pick up and drop off times, but this time the buzz was all about him. One little girl ran up to let him know she'd made him a picture and then announced "I'm going to be your helper!" It turns out the teachers had been letting the kids know Little Dog was coming and they were all excited to help him get up to speed at their school. It was heartwarming. So I brought in my boys, got them settled and said goodbye. I warned the teachers about his need to be reminded to use the potty if he was overly involved in any activity. I let them know about his stubborn streak and even filled them in on his stress induced hitting. Then I just hoped for the best. He's a great kid, funny, smart and sweet as anything, but he can also be a handful. He doesn't have the same people-pleaser tendencies his brother does and I was a little worried that might be an issue. At pick up, as he sat fully engaged in a game of I Spy, his teacher assured me he'd done great. Everyone wanted to help him, he followed the routine without a hitch and did a great job of taking cues from other kids about what he should be doing when. In fact, he didn't want to come home. I think I'm going to call that a success. It does make me wonder why I worry so much about these things? Maybe I just thrive on anxiety. Glad to hear it went so well! I love that there were so many helpers for him. And don't worry the anxiety is normal. Awesome! So glad he is enjoying it.